V2486. 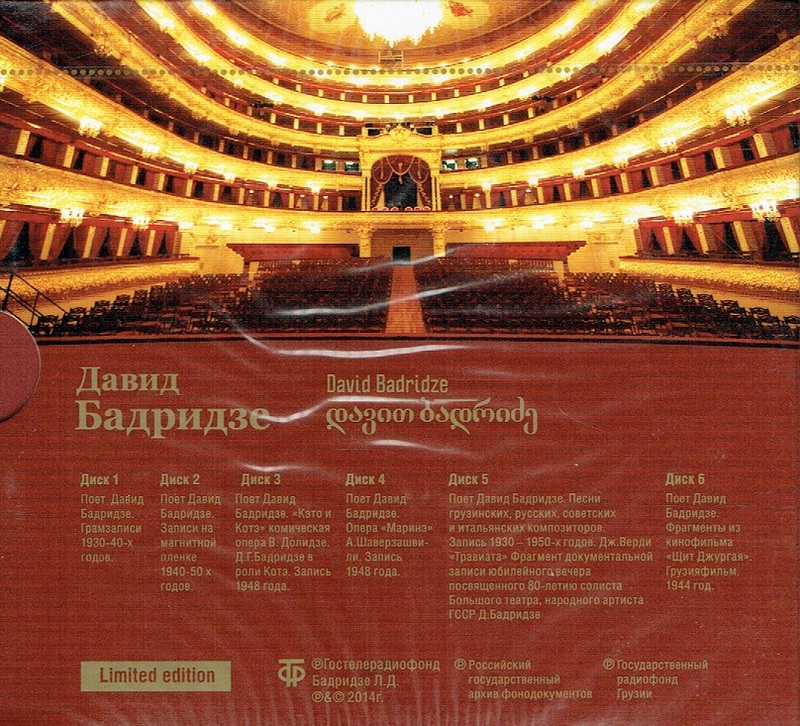 DAVID BADRIDZE: Russian Romances, Italian Songs & Operatic Arias - recorded 1930-50, plus LA TRAVIATA - Act III, 5 April, 1962, w.Azmayparashvili Cond. 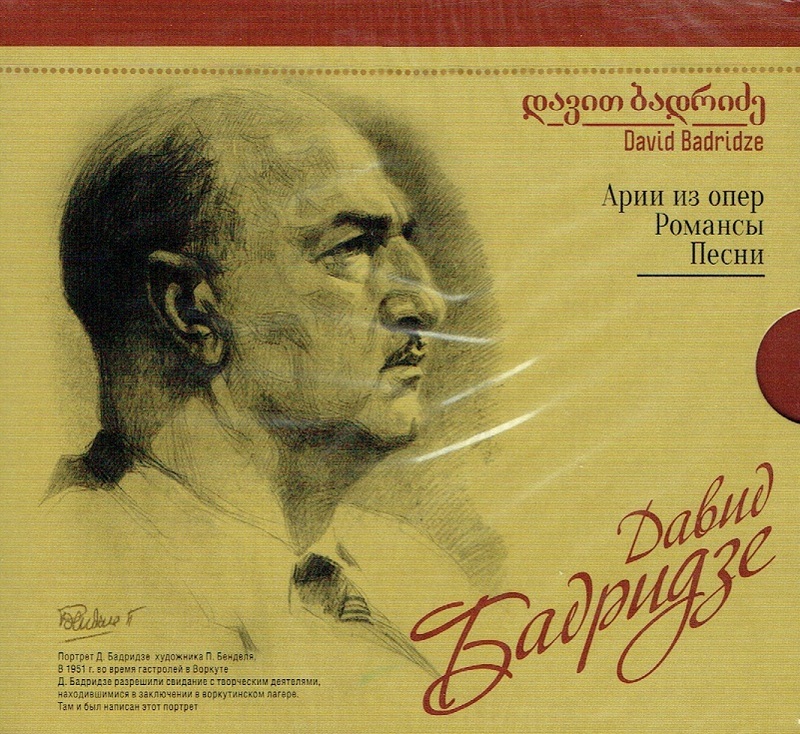 Tbilisi Ensemble; Gayane Dolidze, David Badridze & Peter Amiranashvili ; Viktor Dolidze's KETO AND KOTE, w.Galina Sakharova, David Badridze, David Gamrekeli, Sergey Gotsiridze, Zinaida Sokolovskaya, etc., 1948 performance; Shaverzashvili's MARINE, w.Gayane Dolidze, Claudia Konstantinova, David Badridze, Alexei Korolev, Olga Osipova, etc., 1955; plus a DVD of Fragments of the concert movie SHIELD DZHURGAYA, Tbilisi studio, 1944. GTRF, Russian State Archive of sound recording. Slipcase Edition, incl. 68pp booklet. Specially priced. 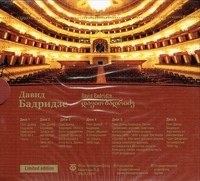 "If you like the type of ‘Russian’ tenor voice that was Kozlovsky’s, Lemeshev’s or Orfenov’s, you should certainly warm to that of the Georgian tenor David Badridze. His operatic repertoire encompassed a wide range…." The Russian State Documentary Film and Photo Archive at Krasnogorsk was founded in 1926. Prior to 1918 all film and photo documents were the private property of their creators. With the Decrees of Soviet Government of 1918-1919 the production, accounting and use of film and photo materials was given to the State, as the entire industry was nationalized. Photo albums and positive photo materials of pre-Revolutionary time and the first years of Soviet power were concentrated at the Department IV of the State Archive of the Russian Soviet Federative Socialist Republic, which was later reorganized and became the Archive of October Revolution (AOR). As of 1926 the Archive of October Revolution was receiving film documents from the storehouses of the Skobelev Elucidative Committee, Soviet film organizations, including Sovkino, Proletkino, and Narcompros RSFSR, the Leningrad Historical and Regional Archives, and from private persons. Between 1927 and 1928, a special depository for film documents was organized in the Archive of October Revolution, but the idea to concentrate all film materials in one place did not work well up to the end of this period. Some film and photo documents still remained with scientific institutes, museums and other organizations. Taking this into consideration, the decision was made to organize an independent film and photo archive and to construct a depository for storage of the documents. Construction was begun in 1928 in Moscow on the territory of former Lefortov Palace. But the documents placed in the new Central Photo and Film Archive remained unsorted for 10 years. In 1934 the Central Photo and Film Archive was consolidated with the Central Archive of Sound Recordings and was named - Central Photo, Phono, and Film Archive (CPPFA). In 1953 Archive moved into another building in the town of Krasnogorsk near Moscow where it is located today. In 1967 the Department of Phonograms of the Archive split off as an independent archive, the Central State Archive of Sound Recordings of USSR. Between 1967 and 1992 the Film and Photo Archive was called the Central State Archive of Film/Photo Documents of USSR. In 1992 it was renamed the Russian State Documentary Film and Photo Archive (RGAKFD).